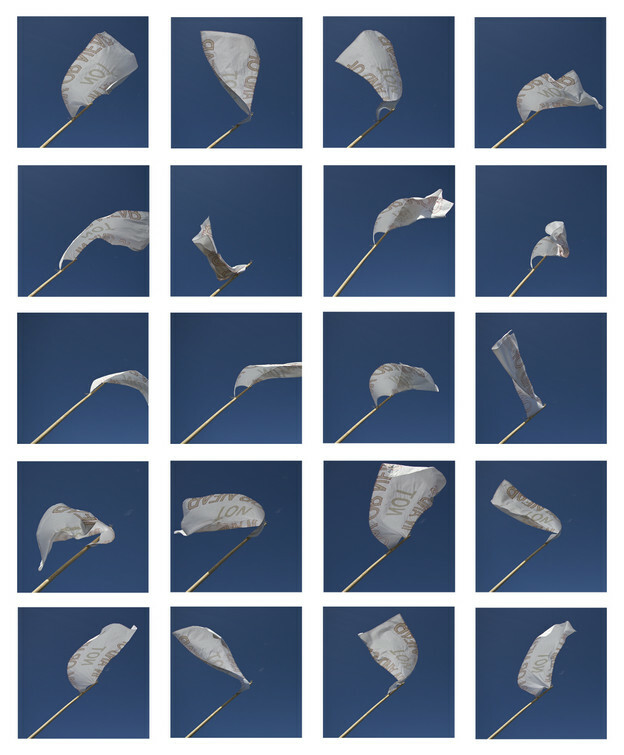 "Surrender Flag Grid," from Jared Stanley and Megan Burner's excursion, "The Aeolian Marsh." Then the poem growled. Woods escalated from a screen to a wall to a page where an invisible hand was drawing. A book backed off onto roadside stones. An island absorbed a microphone. The poem had a body. The body a lens big enough to swallow something. Its eyes scaled trees. The trees were not hollow but sunk with echoes. When Michel McClure read his poems to lions in the San Francisco Zoo in the 1960s, he growled and growled. (In a video of this event, the lions appear agitated, pacing and tossing their heads. Their cages are cages, metal boxes bracing fierceness; today they inhabit glassed-in miniatures of savannas.) An earlier moment of a poem tearing itself open via sound, an invitation to linguistic margins, and inhuman otherness. Throughout the Conference on Ecopoetics, poems could be seen, heard, felt, along these margins; migrating from, around, above, within, a page. This post provides an overview of some of those migrations, and swoops down on a few. In an overview of “The Book, Ecopoetic Instrument,” Jared Stanley (presenting alongside Richard Greenfield, Brenda Ijima, and Tyrone Williams), writes that the panel set out to investigate work “outside, beyond, and in excess of conventional textuality.” One place from which these outsides and excesses draw their exuberance, Stanley suggests, is “the body” as a “multi-locational and ever-changing” thought machine. CA Conrad’s (soma)tic poems, which he read from during the “Thingness of Things” roundtable (many more can be found here, and in A Beautiful Marsupial Afternoon) are emblematic of this body/mind/poem continuum, in which the work of poetry actually begins in a body’s motions, memories, its staged or surprise encounters. Conrad’s (soma)tics merge experience and writing in ways that blur the beginnings or endings of poems along with “instruction” and “inspiration” as formative forces. (Arielle Greenberg’s “dirty” garden poems, some of which she read Friday night, offer another trajectory for poetic experiments grounded in the body). These investments in the body of a poet, or the bodies of other humans and non-humans encountered by that poet en-route to her poem, necessitate an expansion of poetic boundaries, frequently before the poem even begins. Of all the panels I was able to attend (and unfortunately, some of the reporting above is based on second-hand accounts; despite all these expansions of poems and bodies I wasn’t able to split myself asunder and attend multiple panels at once), “Field Laboratory for Esoteric Ecologies” most emphatically explored expansions of poetic boundaries along multiple vectors. Presentations by Kathleen Brown, Erin Robinsong (and their collaborators, musician David Ip-Fung-Chun, and projection artist Sean Frey), Adam Dickinson, Jonathan Skinner, and a rawlings combined (respectively) music, dance, video, painting, equations for polymers, animal songs and sounds, photography, internet installation, and audio records. During a twenty-minute version of the hour long piece, “Osculations on a Theory of Islands,” a giant white tarp morphed variously into an island, an ocean, a mountain, a phantom, a cloud, an inhuman embrace. (Check back here for video recording of this piece). Kathleen Brown and Erin Robinsong danced, spoke, disappeared into this morphing plastic presence in front of a screen whose images of woods and water wandered upwards toward the ceiling, or were interrupted by white lines that sometimes seemed to be the tarp itself, or a window through the digital woods into the hallway, or beyond. The theme of “islands” (eye-lands, is-lands, I-lands) that soldered together this work also emerged in work on a rawlings’s Gibber site, an interactive website compiled during a residency in Queensland, Australia. In the “Land” section of “Gibberland” a central term—Land—turns color, fades, and returns as prefixes, suffixes and additional words flank or follow it alphabetically, producing variants like “Barren Island," or "Edens Landing.” Brown, Robinsong and rawlings question the “isolation” that supposedly an island is (and that no man is); and they remind us of the materials over which we “write” (or dance, or draw, or float, or sing). This work takes word play seriously. (For another example, see Erin Robinsong’s “Variable Whethers,” from which an “able ether” emerges as letters spin, rain, absorb; where whether is weather, and both conjectural and concrete). At the same time, rawlings in particular is acutely aware of the violence that linguistic structure, sign, and even play, are capable of enacting on inhuman space. On the Gibber site, she places words in vials, places transparent phrases into branches, or in waves, puts words onto the ears of cattle, as the impetus for naming, branding, and thereby, owning, becomes transparent. Bubbles sink into the sand. Here, reader: a poem. Another one. And another.